The main currency pairs: CHFJPY, EURCHF, USDCAD, EURAUD, USDCHF. so bad an ea that only show good result on BT. author seems do nothing to give good support. dont waste any money in this ea. I earn NOTHING from this EA. Do not waste money with this EA, only losses in 6 months real money! add hateful to make a new EA same Name same Logica , instead of improving this existing, it publishes another equal, just to earn from sales! I like to see that MQL has removed part of my previous review. Instead of making this PIRATE profitable with an update. He publishes another one! Работает, но не предел совершенства. Есть советники и дешевле, и в то же время более стабильные. 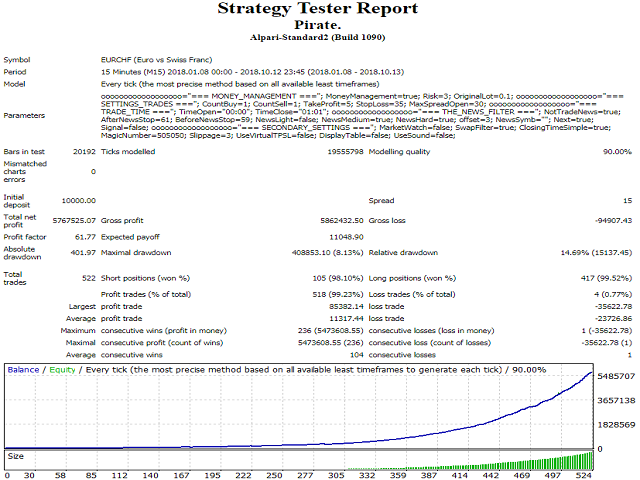 Don't trust EAs without long term LIVE Signals ! 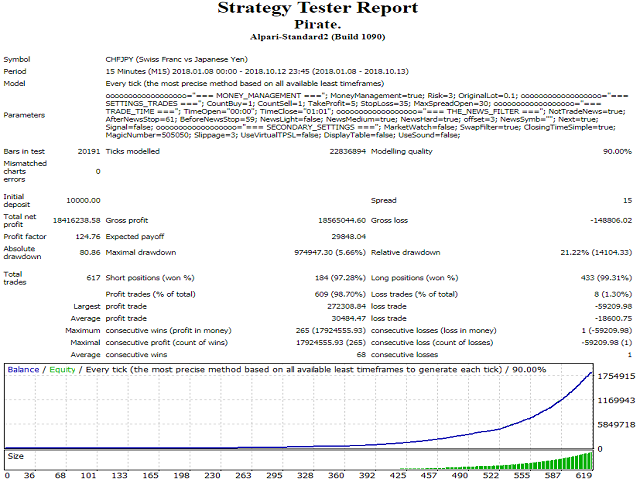 Backtesting and real trading different ! Последняя модификация имеет новостной фильтр, что радует, однако также бывают большие убытки, что впрочем сглаживается на дистанции, т.к. стратегия заложенная в советник похожа на стратегию пережидания убытка, делайте вывод сами средний Take Profit 4 при среднем Stop Lose 40. В целом хороший советник который реально зарабатывает на рынке а не только в тестере! Единственно чувствителен к ночному спреду, т.е. необходимо подобрать Брокера с фиксированным (рыночным) спредом. I have been running this EA for two months and still running in profit. Great. One of the best expert advisors. Do not worry about losing money that it's not a martingale or grid system. I can only thank you for this excellent work. 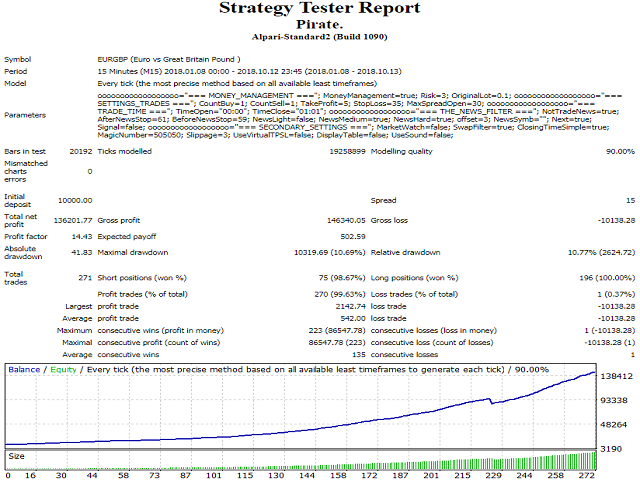 Very good EA with stable results in the first week of testing. The results are also consistently to different accounts and brokers. 99,9% Backtests promising also stable results during different market situations over long term. To highlight is the outstanding support of Anatoliy. He is every time very helpful and reply PMs very quickly. Update: Since author has implemented the news filter it's constantly profitable if you stick to his set files and Alpari as a broker. Can't say if it works with other brokers. Nueva versión, bastantes mejoras, tiene bastante potencial y sobretodo Anatoliy siempre esta dando soporte!. after using that EA in live Forex Market, i can say he is worth it. The only thing is that trades startet in news time they go wrong. So i disable the EA in the Pairs at news Time. You Can see my last Statement at Page 19. I use only 0.5 - 0.7 Risk at 8 Pairs !!! Half the money, but hope is getting better. Это лучший советник! Низкая просадка и высокая доходность, трейдинг без стрессов. Proven to be effective in any market condition. 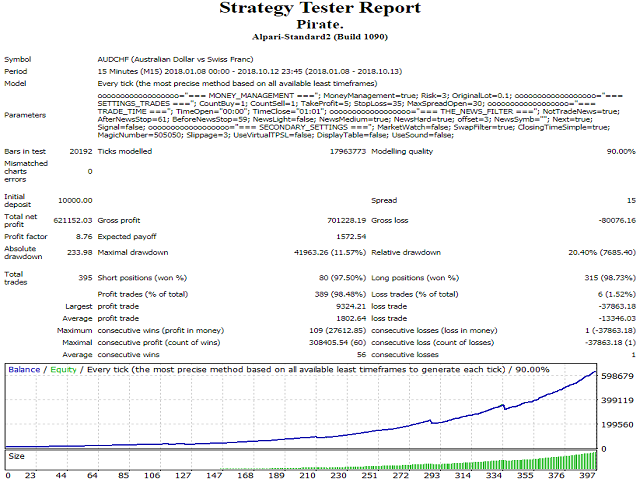 Utilizes stop loss for safe long-term trading. Исправлена ошибка функции торгового времени. Эксперт работал не корректно при заданном времени внутри одно часа. Все переменные остались без изменений. The MARKET_WATCH variable has been added to the settings. If set to TRUE, a position is opened first, STOP_LOSS and TAKE_PROFIT are set on the next tick. 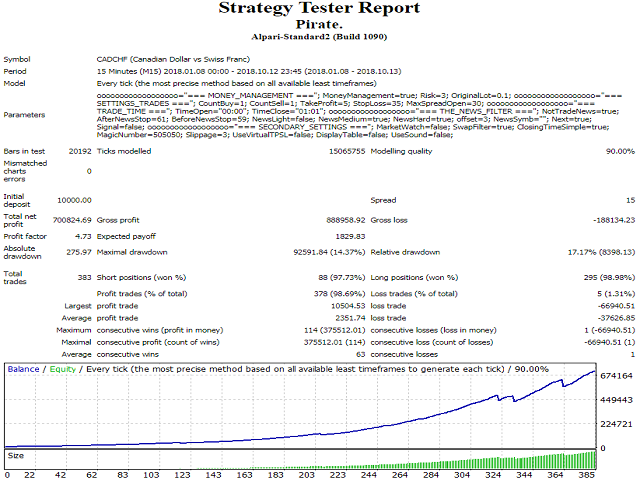 If set to FALSE, a position if opened with preset STOP_LOSS and TAKE_PROFIT values. Fixed opening positions by time. After changing the part of the function, trading start and end time match the specified time by hours and minutes. The minutes worked incorrectly before that. Minor changes in the code. Fixed the graphic display of the banner.